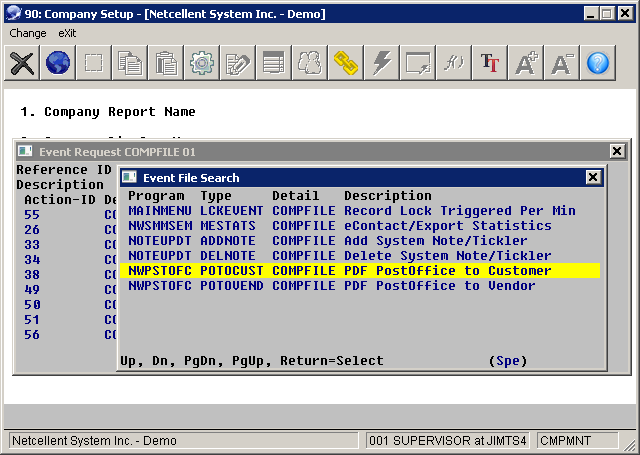 Elliott provides PDF PostOffice log files for investigation purposes. So. for example, for normal invoice printing, company 01, on 12/01/2016, Elliott would create a log file named M:\Elliott7\Log\01\PDFPostOffice-CPINVPRT161201.CSV. If the file is busy when logging occurs, a timestamp will be added for a new filename, such as M:\Elliott7\Log\01\PDFPostOffice-CPINVPRT16120-130504.CSV. So, the log records for a specific day will be in all the files that contain the date, with or without a timestamp added. Email: Y, N or blank. Y means email successfully sent (whether or not it reached its destination); N means there was a problem sending the email; blank means no email address to send to. Fax: Y, N or blank. Same as above. Print: Y, N or blank. Same as above. Disk: Y, N or blank. Same as above. Customer Number: or Vendor Number. Customer Name: or Vendor Name. Document Number: The order number. With PO printing, the purchase order number. With A/R statement, blank. Invoice Number: Blank if not printing invoices. Email Address: The contact's email address or fax server address when emailed. Blank otherwise. Error: Error message if there is some kind of failure. Task: CPINVPRT, CPORDPMT, ARSTMNTS, etc. Success: Y or N to indicate successfully sent. The Administrator may want to subscribe to failures only. Error Message: If there is an error. For example, you can subscribe to the event when "Success" = "N". That allows you to email to an administrator an error notification whenever the system failed to send a PDF PostOffice document.